The Idol’s will be at the Allstate Arena in Rosemont July 7th. Tickets are available via www.AmericanIdol.com,www.ticketmaster.com and www.aeglive.com. As presenting sponsors of AMERICAN IDOL LIVE! Tour 2012, CHIPS AHOY! and RITZ are thrilled to bring the excitement of the tour to their fans in a number of unique ways, from cookie and cracker coupons to a one-of-a-kind consumer promotion. This year, audiences get to walk away from an exhilarating show feeling even better about their experience knowing that $1 of every ticket purchased is being donated to The Heart Foundation (www.theheartfoundation.org). AMERICAN IDOL LIVE! 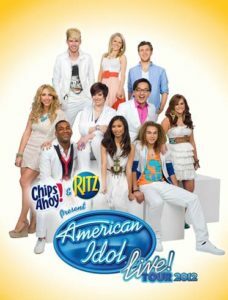 gives fans the unique opportunity to be up close and personal with Idol finalists: Colton Dixon, DeAndre Brackensick, Elise Testone, Erika Van Pelt, Heejun Han, Hollie Cavanagh, Jessica Sanchez, Joshua Ledet, Phillip Phillips andSkylar Laine. Podcast with American Idol Season 13's KHRISTIAN DAVIS from SHOWBIZ CHICAGO on Vimeo.